Have you ever tried business name generators on the internet? You know, the ones that spit out arbitrary random words when you click on them? Well, the NameRobot generators are nothing like them at all. NameRobot's name generators help you create catchy business and product names specifically fit to your project and allow you to check the resulting names for availability afterwards. Each name generator develops a different kind of name - ranging from fantasy names and acronyms all the way to figurative and descriptive names. With our name generators, anyone can create a unique name for their business. Our tools lead you through the process of naming and give useful advice and inspiration. 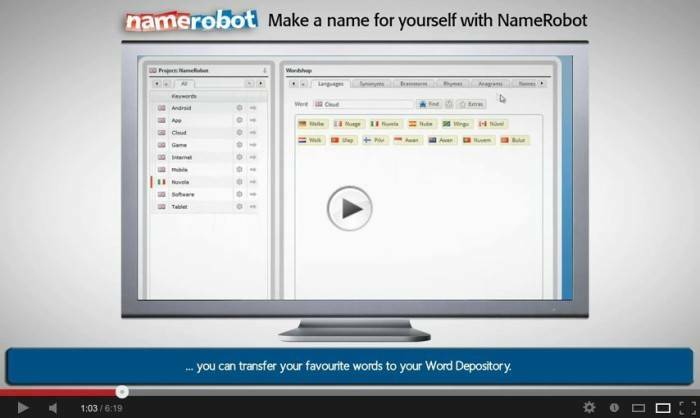 On the following pages you will find a short presentation of NameRobot's variety of business name generators which will help you in find a catchy and unique name for your company, product or project. Not sure where to start your name search? Simply use the import tools in the Word Import. Here you can add your main keywords and take your first step in the naming process. Depending on your initial situation, there are three different starting points available.